Big Elwyn is set to start his journey from the idyllic Vale of Glamorgan, Cardiff all the way down to the fashionable town of Belgravia where he is being showcased in all his glory in our London showroom. We contacted the delightful Hayley Lewis after seeing her work on Instagram as we were blown away by her talent and ethos behind her work. 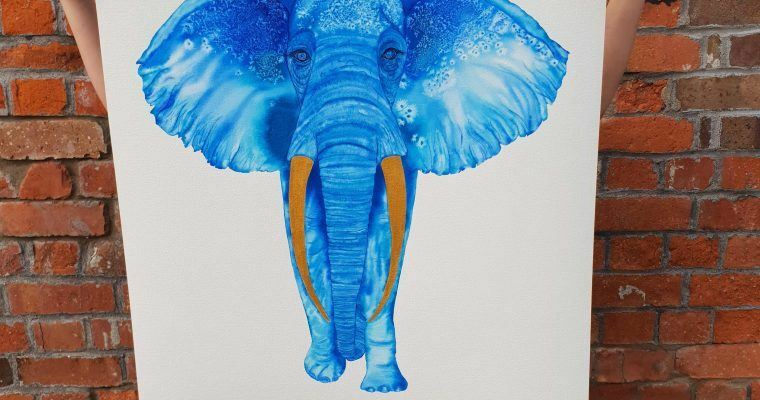 Hayley has held an interest in the depiction of animals in art: particularly the elephant which led her to uncover the seriousness their endangerment. 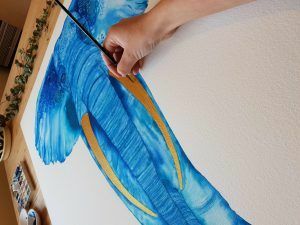 Hayley works towards showcasing and conveying the role and nature of elephants through the ages with their magnificent forms, using an illustrative method of blue and white painting. Her intricate detailing and beautiful use of colours attracted us straight away and we wasted no time in having our very own painting created. If you want to find out more about Hayley Lewis and her work, simply click here. 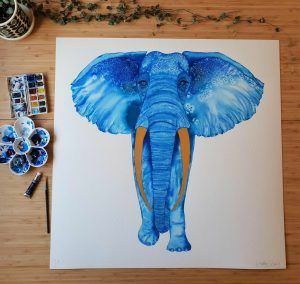 Exclusively to our London showroom is this wonderful hand painted Elwyn the Elephant painting with precious gold tusks, a symbol which Hayley is trying to raise awareness for ivory poaching. The painting hanging in our London showroom (shown below) has been painted on Arches Aquarelle 640gsm 100% cotton paper, at approx 72cm x 72cm framed in our handmade solid fumed oak frame (70cm x 70cm without a frame). Should you wish to enquire about this original piece, please call our Londown showroom on 0207 730 6442 or email jessica@theoddchaircompany.com, we’d be delighted to hear from you. A 10% donation has been to the The International Elephant Foundation (IEF) who are the catalyst for creating a sustainable future where elephants thrive. IEF’s projects focus on both the endangered Asian elephant and the severely threatened African elephant for reducing human-elephant conflict, have a look at their website for more details https://elephantconservation.org.